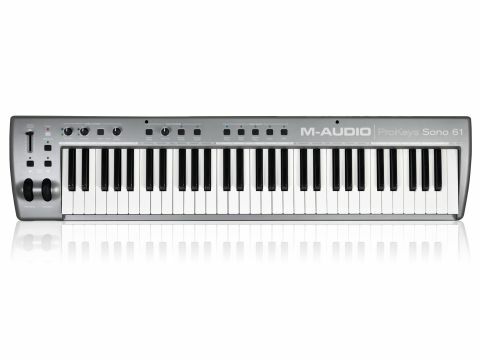 Perfect for songwriters who want to jam and record, this is a welcome addition to the MIDI keyboard market. Well played, M-Audio, well played. Extremely versatile. Can be used with or without a computer. Decent grand piano sound. Plays better than many other controllers. Keys aren't hammer-action. Can be a little fiddly to use. Its appearance might lead you to suspect otherwise, but the ProKeys Sono isn't a typical MIDI controller keyboard. It's a cross between a stage piano and a controller keyboard/interface - a novel concept in the computer music market. Available in 88- and 61-note versions (we're reviewing the latter here), this USB device offers velocity-sensitive, semi-weighted keys and standard controller features such as pitchbend, mod wheel, octave up/down buttons, MIDI jack and sustain pedal input. The Sono is also a 16-bit/44.1kHz 2-in/2-out audio interface - you get an XLR mic input, a 1/4-inch instrument input and stereo RCA inputs round the back. There are two 1/4-inch main outputs, with a pair of 1/4-inch headphone outputs conveniently positioned at the front. However, this controller's unique selling point is that it's also a portable digital piano with five main sounds: Grand Piano, Bright Piano, Electric Piano, Organ and Clavinet. Each of these is accessed by pressing the relevant button on the top panel. Chorus and reverb effects can be called upon in the same way. This device goes further still by throwing in a complete bank of General MIDI patches: 128 workhorse sounds for composing entire tracks. One of the ProKeys Sono's biggest strengths is its versatility. When it's hooked up to a computer, it's primarily a controller and audio interface, but you can also route the internal sounds directly into your sequencer over USB. OK, you might have better versions of these in your plug-in rack, but it's still good to have this option, which can be turned on and off with a press of the D#1 key in Edit mode. It's also possible to send MIDI data from your DAW to the Sono's internal voices. All you have to do is select the 'ProKeys Sono Voices' destination on the appropriate MIDI track(s). This could be useful to anyone who wants to play back Standard MIDI files. Sono's standalone features, including mic and audio inputs, makes it useful for singing pianists or for jamming with other musicians such as guitarists. The keyboard is class-compliant and so was recognised by our test Mac as soon as we hooked it up. As far as the onboard sounds go, the grand piano, which was sampled from a Steinway, is the pick of the bunch, and the other four voices are very convincing. Unfortunately, calling up the GM sounds isn't quite so straightforward, requiring you to go into Edit mode. Once there, you have to either enter the program number of the desired patch or reassign the octave up/down buttons so that they can be used to scroll through the bank. However, because there's no display, you never know which sound you've selected until you actually play it, which could lead to some comical onstage moments. Quality-wise, the GM bank is pretty much as you'd expect: fine in places, but decidedly 'hobbyist' in others. As an audio interface, the Sono performs well. There are Instrument and Mic gain knobs (plus signal and peak LEDs), and a Direct Monitor knob to balance the incoming signal without latency. This is the kind of product that could have ended up falling between several stools, so it's to M-Audio's credit that it doesn't. It's not the most fully-featured MIDI controller we've ever tested, but it plays well. And while the keyboard isn't hammer-action, the Sono is also a credible digital piano. Whether you use it with your computer or standalone, the ProKeys Sono delivers.